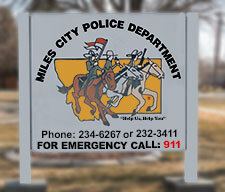 Miles City Police Department is the trademark of Miles City Police Department. This entire website, copy, images, logos, indicia, text, content, and unique method of showcasing products is ©copyright 2018 Miles City Police Department • 210 S. Winchester St • Miles City, Montana 59301. All trademarks appearing herein are acknowledged. Permission to use documents delivered from this World Wide Web site and/or server and related graphics is restricted. The name of Miles City Police Department or any of the above referenced trademarks or logos may not be used in advertising or publicity pertaining to distribution of this information without specific, written prior permission. The information contained in this website is subject to change without notice. Miles City Police Department is not responsible for typographical, technical or descriptive errors, misrepresentations, or misunderstandings of products, services, companies, persons, or events listed or posted herein.